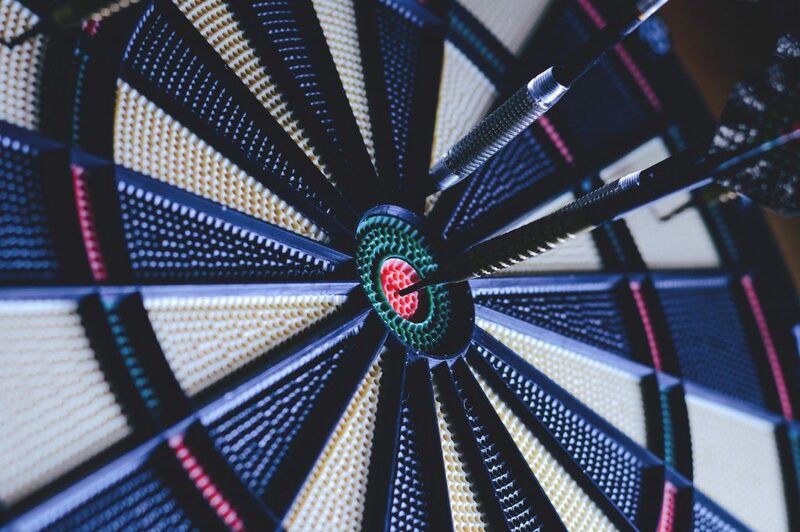 Whether you’re looking to practice for the tournaments at the local pub, or just want something to spice up the games room, getting the right dartboard is a pretty important choice! In this buyer’s guide, we’ll review a few of the best dartboard choices out there in 2019, including bristle and electronic options. After that, we’ll discuss some key things to consider when buying, helping you pick the perfect dartboard for your specific needs. DEFINITION: bristle dartboards are the traditional option. They’d made with a natural material (like sisal) which naturally heals after the darts are removed. We’ll look at 3 of the best bristle dartboards for sale right now. The Winmau Blade 5 Duel Core is a great quality dartboard that really ticks all the boxes when it comes to durability and performance. Constructed using two layers (hence the name) of quality Kenyan sisal, this regulation-size board is going to stand up to many hours of use by players of all skill levels, and retains its surface integrity better than many of its competitors. Endorsed by the highly respected British Darts Organisation (BDO), the Blade 5 Duel Core has an ultra-thin inner wiring system (spider) that’s completely staple-free, meaning you won’t have to worry about it coming loose over time. This wiring system provides around 14 percent more scoring area than Winmau’s previous Blade 4 model – about 9mm more per double and 6mm more per treble. The super-thin wiring also helps to cut down on dart deflection and bounce-outs, which is great. Plus, the outer wiring (number ring) is rotatable, meaning you can give some of the more commonly-hit scoring areas (hopefully the treble-20!) a rest every so often to prolong the life of the board. What really sets the Blade 5 Duel Core apart from other dartboards is its two-layer surface construction. The highly compressed under-layer of sisal gives the board outstanding durability and hold, while the less-compressed outer layer allows for excellent dart penetration. Both layers are self-healing. All of the features we’ve just mentioned come at a premium – you’ll find the Blade 5 Duel Core to be a bit on the expensive side. However, if you’re serious about darts, this board is well worth the extra cost. The DMI Bandit has been one of the most widely used boards in the world for over 20 years, but it’s still an incredibly popular choice in 2019. This World Darts Federation-sanctioned board is so highly regarded, in fact, that since 1999 it has served as the official dartboard of the World Cup of Darts. Like most good quality boards, the DMI Bandit is made of sisal bristles which are extremely durable and will maintain their ability to grab and hold darts really well over time. The rigid mounting brackets include levelers, which help the board affix to pretty much any type of wall. It also features a lightweight backing board as well as a molded composite edge, resulting in cleaner lines and a more professional-looking appearance. The sisal bristles on the face of the board are very dense and more tightly-packed than you’re likely to find on most other comparable dartboards. This means that the board can self-heal faster, ensuring that you don’t cause long-term damage through regular playing sessions. However, this design can cause issues for players with a slightly softer throw, who may experience bounce-outs even when they hit the board dead-on, due to the density of the surface. Unlike most dartboards, the stainless steel spider on the scoring surface is actually embedded into the sisal bristles, which goes a long way towards eliminating bounce-outs and deflections. It also increases the size of the scoring area by roughly ten percent. The number ring is still a raised wire, however, and can be easily rotated to increase the life of the board. Plus, the numbers themselves are quite easy to read, and are even powder-coated for increased durability. Embedded wiring on the playing surface. Some players experience bounce-out issues. If you’re looking for a good, no-nonsense dartboard to help up your game or for your kids to practice on, you can’t go wrong with the Viper Shot King. It’s a regulation-size board, which can be used with both steel tip and soft tip darts, making it a versatile option which is also suitable for younger players. The board is made of durable compressed sisal just like the more expensive models, and also features an extended catchment area to protect the surface it’s mounted on. While the spider on the scoring surface does utilize staples, it’s made of thin, rounded, galvanized wire which is designed to help close shots slide off into the target area. Plus, the bullseye is staple-free, which cuts down on bounce-outs. The number ring detaches and reattaches quickly, meaning you can rotate it to easily extend the life of the board. A simple yet sturdy mounting system makes it a breeze to move the board from place to place, or take it off the wall for storage. Viper’s product is quite durable and has good self-healing capabilities considering the price. It is a relatively inexpensive dartboard, and so provides excellent value for money. If you’re looking for something you can get going with quickly, or just want better bang for your buck, this is a good pick. It comes with darts and an instruction book, making it a great gift. There are better-quality options with better self-healing qualities out there, however. Can be used with steel or soft tip darts. Won’t last as long as most more expensive options. DEFINITION: electronic dartboards are the more technologically advanced variety. They often feature interactive game modes, automatic scoring, and use soft-tip darts for improved safety. If you’re after a top-of-the-line electronic dartboard, check out the products we’ve reviewed below. Anyone in the market for a top of the line electronic dartboard is going to want to check out the Arachnid Cricket Pro 800. This board has a 15.5 inch scoring surface with a reinforced nylon face, providing excellent durability. Arachnid have used square holes in the nylon on the playing surface as well as micro-thin dividers, which help to reduce bounce-outs, but are still tough enough to withstand direct hits. The Cricket Pro 800 can accommodate up to 8 players at a time, and the LED score display is nice and big, and easy to read. Highly responsive sensors placed throughout the playing surface accurately register hits and automatically calculate scores in real time. This machine also offers a feature that will applaud good shots and insult (or heckle) poor ones, which can be turned off if desired. You get an inbuilt computer which is pre-programmed with 39 games – including 7 cricket varieties – and over 175 variations, meaning it’s quite hard to get bored of this board (no pun intended). It’s also possible to program the machine to track improvements in your game and provide points-per-dart calculations at the end of a session. Onboard dart storage areas are provided, and extra soft tips are included, meaning this board works great with younger kids. What’s more, Arachnid include a one-year warranty, so you don’t have to worry about anything breaking on its first few uses. Some people have had problems with the initial set-up of the machine, and have found the instruction manual a bit difficult to follow. However, once you have it up and running, the Cricket Pro 800 proves to be a reliable, durable machine that is quite user-friendly. Large variety of game options. Comes with an automatic game tracking feature. Can be a little tricky to set up. If you’re looking for a slightly more substantial electronic dartboard that comes with its own cabinet, the Fat Cat Electronx is definitely worth checking out. 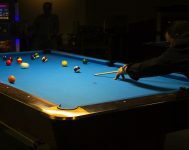 For the extra money, what you’re essentially buying is something that would make an awesome visual addition to any games room or living room – not just a dartboard. But this isn’t actually an expensive product. As of the time of writing, it’s actually on sale for a very reasonable price. So how does it actually perform? There are 38 included games and 167 scoring options, and the Electronx will accommodate up to 8 players. Its surface does a fantastic job picking up darts, and it comes with a hair-thin spider. The end result? Next to no bounce-outs. This board is powered with mains electricity, meaning there’s no need to mess around with batteries. But you will need to ensure that it’s located somewhere near a power outlet. The only thing we can really fault this dartboard for is its durability. Although the cabinet is quite well-designed, the board isn’t incredibly tough. However, it does come with a one-year warranty for peace of mind when buying. Cabinet doors allow easy storage and helps protect walls. Lots of games and variations. Board itself could be more durable. In terms of looks, nothing really beats the Marauder 5.0. Not only do you get traditional red/green scoring zones – the display has a vivid backlight, and is full of color. The doors are made of actual wood, and have a nice veneer finish which looks great when closed. However, this is a very slightly more expensive board, probably because Arachnid have taken the time to ensure that the cabinet is really well made. You get 37 games and 137 scoring options – pretty much the same as the last two electronic boards we looked at. There’s plenty of variety here, and the heckler feature helps to keep things that little bit more interesting. Plus, there are solo game modes, so you can get some sneaky practice in before that party you had planned for the weekend. Everything’s pretty simple to get going, and the darts have a soft tip, so you could use this board to keep the kids occupied for a couple of hours on the weekends. The scoring area is also pretty big, providing that little bit of extra protection for your walls from errant throws. Unfortunately, the spider isn’t quite as thin as on the Fat Cat Electronx, meaning bounce-outs are a little more common. Plenty of variety in the modes on offer. Spider is a little thicker than we’d like it. Here are a few things to consider when shopping for your next (or first) dartboard. What types of dartboards are available? Magnetic dartboards are most often used by young children, while cork boards (although very inexpensive) are quite flimsy and won’t last long. For serious darts players at any level, bristle and electronic options will be the boards of choice. Close-up of a bristle dartboard. Bristle dartboards are generally made of tightly compacted sisal fibers and feature a wire “spider” – this is what separates each scoring zone. They will also usually have a rotatable outer number ring, allowing you to give the most often-hit areas of the board an occasional rest, prolonging the life of your dartboard. Bristle dartboards are normally used with steel tip darts. After you pull out the dart, the sisal will close around the hole left behind, making the board self-healing in effect. These types of boards are the most popular options around today, and are what’s used in professional darts tournaments, both here in the states and in the UK. Electronic dartboards on the other hand are basically computers that have been purpose-built for darts. The board will register hits using microchip technology and automatically calculate the score, which is displayed on an LED read-out. They usually have a perforated nylon scoring surface and require the use of a soft tip dart. Most of these types of darts actually have a metal frame with a soft plastic piece on the end. These dartboards will generally be more expensive than bristle boards, but are more convenient, and are better-suited to families with kids. Plus, if you miss the board completely (it happens to the best of us), your wall won’t need replastering. Although they may look very similar to the naked eye, not all bristle dartboards are created equal. The two things you will want to pay the most attention to are the density of the sisal, and the design of the spider. Generally speaking, if you have a standard or hard throwing style, you will want to choose a board that has a quite densely-packed sisal scoring area, because it will heal faster. The density of the sisal will have a very large impact on the durability of the board. The denser it is, the quicker the board will self-heal and the longer it will last. If you have a lighter throw though you will probably want to go for a board with a less densely-packed scoring area, to help minimize bounce-outs. The construction of the spider (the metal wiring over the scoring area) can have a major impact on your game. A thinner spider with a tapered top edge is usually your best bet, as this will help with deflection and bounce-out issues. However, you don’t want the spider to be too flimsy, otherwise it may break when hit. With electronic dartboards, accurate calculations and scoring area sensitivity are two very important things you will want to take into consideration. Multi-player options are quite common, so if you’re playing with a large number of friends on a regular basis, you will want a board that can accommodate all of them. You’ll be best served by a board with a sturdy nylon scoring surface, as this material is generally better at capturing the darts. As far as added bells and whistles are concerned, the more you’re willing to pay, the more you’ll get. Advances in the technology now allow these machines to track per-dart scoring patterns, analyze performance over time, remotely connect with players in other locations, and provide verbal reinforcement or criticisms after every shot. Pretty much the only thing an electronic dartboard won’t do is retrieve your missed darts… at least, not yet. How big should a dartboard be? Most “tournament” size bristle dartboards will be 17.5 to 18 inches in diameter and 1.5 inches thick. They will have a scoring area of 13.5 inches, divided into 20 main and 80 overall sections – plus the bullseye. Normally, electronic dartboards will feature a 15.5-inch scoring area, divided in the same way. Larger, oversized boards with bigger scoring areas are also available, and are often used by younger players to hone their skills. What is the best type of dartboard for beginners? This will really come down to the age of the player, and how interested they are in learning the game. If your kids are very young you may want to consider buying a magnetic dartboard, primarily for the sake of safety. After about the age of 8 or so, as your kids’ accuracy improves to the point where their throwing no longer poses as much of a threat to themselves or your walls, a lower-end electronic dartboard which uses soft-tip darts will probably be the way to go. For adults who just want to learn how to throw accurately and not worry about the intricacies of scorekeeping, a moderately-priced electronic model will probably be the best choice. Along with automatically calculating your score, most of these machines come pre-programmed with a number of darts variations, allowing you to learn multiple game types more easily. When it comes to buying a dartboard, the best type to choose is really going to be down to how serious you are about the game. As with most things in life, the more you’re willing to invest, the better quality and performance you are going to get. However, the most important thing to keep in mind is that darts is meant to be an enjoyable sport, so whatever you choose – have fun! We hope this guide has given you an idea of the types of dartboards available, and what to look for when you shop. If you have any questions, please go ahead and ask them in the comments.